Road markings indicating the lanes on the highway are largely ignored; the road may have been designed with four lanes, but if there is room, you can easily squeeze in another 2 or 3, especially on the run up to a U-turn “venturi“. 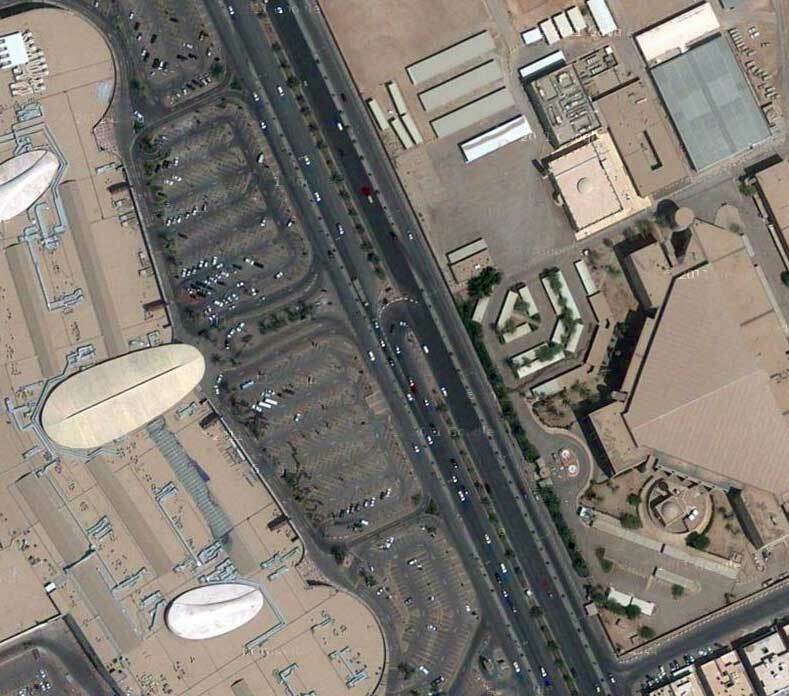 The U-turn venturi is a feature of Saudi roads which surprised me the most, as they sacrifice 3 of the 4 lanes of the typical main road to provide turning space for vehicles which need to make a U-turn from the opposite carriageway. Almost all main roads have a closed central reservation, like a dual carriageway in the UK. The U-turn layout, protected by hefty concrete barriers, needs to be wide enough to allow trucks to use them, which is why they end up taking up so much room. Unsurprisingly, these venturis cause enormous jams, not helped by the tactics used by locals to gain an advantage in negotiating them, which would make even Michael Schumacher blush. More mayhem is caused by the local’s inability to respect the normal rules of the road, especially when it comes to the simple left turn. You have 4 lanes, sometimes expanded into 6 at the junction, and the 2 left hand lanes are marked as those designated for turning left. Seems pretty logical you might think, but to the local drivers they may as well have put a picture of Mickey Mouse on the road. More often than not, the left turning lanes are used for driving straight ahead (especially the extreme left lane, which causes those in the next one to brake or swerve in avoidance, happened twice to me this morning) or someone from the far right lane turns sharply left across 4-6 lanes, messing up everyone’s day. In most countries, traffic lights are arranged to allow both carriageways to flow at the same time, with a filter at each end of the sequence for turning traffic. It is logical and efficient. But not in KSA, presumably because nobody would follow the rules, and they would cut in front of the oncoming traffic to turn left, increasing the already world beating accident statistics. Consequently, each junction gets its own free crack of the whip in turn, which makes waiting endlessly at traffic lights something you have to get used to. The pièce de résistance is surely the rules which govern what happens when the inevitable accident happens, normally at one of the aforementioned places of maximum congestion. KSA has the highest number of road deaths per capita in the world (49 per 100,000 compared to just 3.59 per 100,000 in the UK), but the majority of accidents are simple tailenders or sideswipes at junctions. If you have a bump, you must leave your cars exactly where they stand (middle of the road, blocking everyone unfortunate enough to be behind) and wait until the officially appointed insurance assessor has arrived to apportion blame and approve the repairs. You could not come up with a more insane, congestion promoting concept if you tried. Consequently, road rage is not just an isolated occurrence, it is the normal state of mind on Riyadh’s roads. If only the locals would drive with more consideration for other road users, and the road layout and accident rules were tweaked, the traffic in Riyadh would be 1000 times less congested. The majority of Saudis I have met have been courteous and extremely hospitable, which makes it difficult to comprehend their appalling road manners when they get behind the wheel. Do they have that old-fashioned thing called a driving test in the Kingdom?